I met Kelley 21 years ago today. I’m still delighted. And so far we’re having a practically perfect day. I wonder if anyone at this year’s Clarion or Clarion West is falling in love? One day, someone’s going to write a romance novel set in a 6-week writing workshop. Hey, awesome. Congratulations all around. Happy Anniversary! You two still look the same, in a good way. 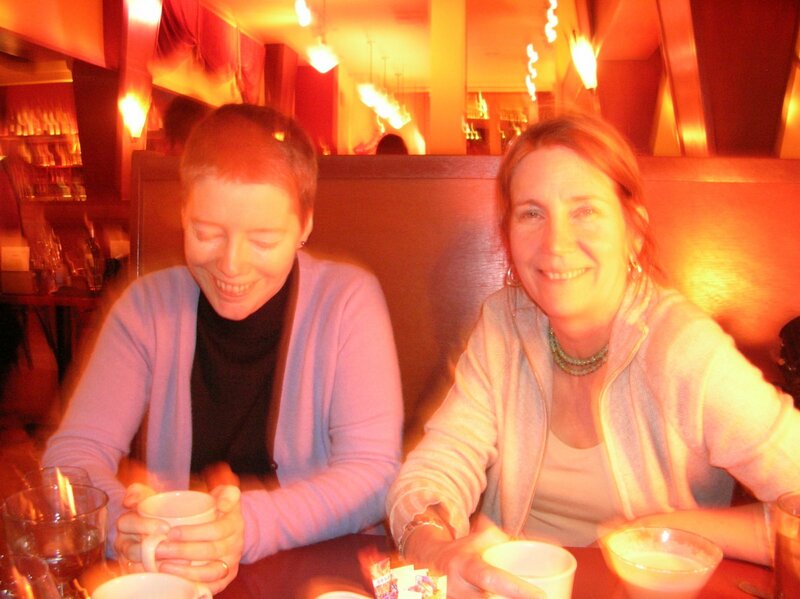 The non-flash photo of Us Now distorts colour–that's actually a sky blue cardigan. But, yeah, I like purple and blue (and green, and grey, and black, and maroon, and varieties of brown, and bright yellow–not keen on orange and white and pink). Oh, so sweet! What a great pair of photos… and congratulations on 21 years together. Gosh you've aged well together, the two of you! I've known my husband for nearly 22 years and it's odd. We grew up together in a lot of ways, and yet there's still stuff that surprise me. Mega excitement for you and Kelley. And congrats of course. I ADORE and COVET those pictures of you and Kelley. Hell, any pic of you two induces the goo-goo-ga-ga factor in me. Happy anniversary! :) Lots of us Clarion sweethearts are celebrating anniversaries right now…it's a nice time of year! Fun photos! Thanks for sharing – and cheers! I'm struck by these photos and how much the same you still look – with that charming smile. 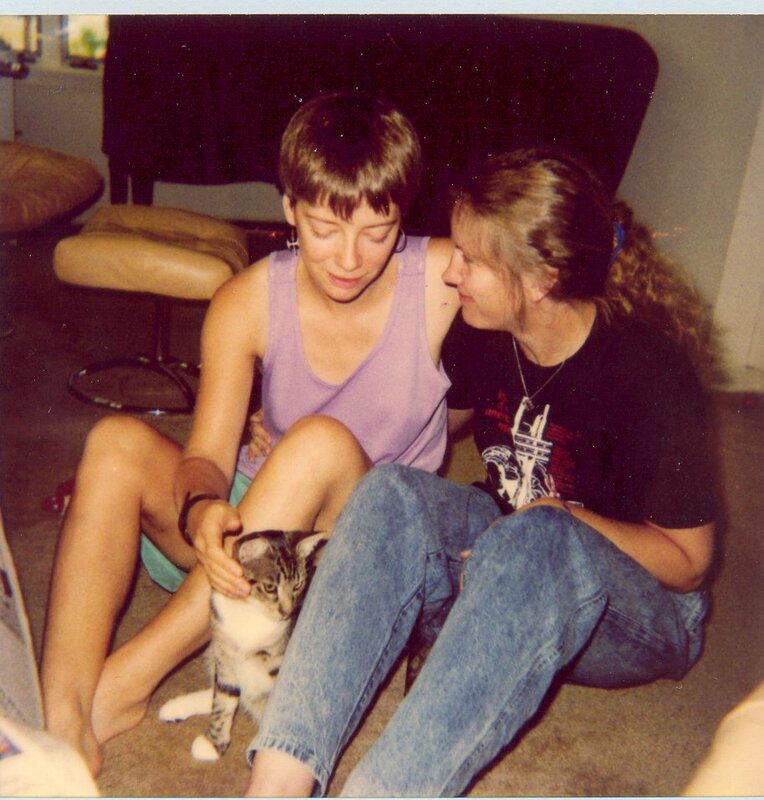 I was thinking of it when you posted a photo from last Sept. a while back – trying to remember what photo I'd seen of you that it reminded me of… Maybe it's this one with the kitten. I find it hard not to smile when the world is treating me well. And the world treats me well a lot. 'Charming' is one of those interesting words that has a very slightly sinister connotation (to me, at least): a hint of facade. (No, I don't think that's what you're saying. I'm taking what you say as a compliment; I'm just ruminating here.) And of course that's true. Most of the photos people have taken of me when I'm unaware show me not smiling, like the pic of me in the abbey that K took in 1991. Huh. It doesn't have that connotation for me, but maybe I could have been more clear on what I meant. I'm not arguing, just clarifying even tho I think you understood me. I know I don't pay enough attention to my word choices a lot of times. In my limited experience with it, I found (surprisingly) you a bit shy when the camera came out (like many). But shy in a delightful and endearing way, and I think those photos show it. Do you think smiling is a form of communication and that mostly when we are thinking/experiencing stuff and not directly interacting with someone we are usually not smiling? Certainly that's not always true – I know I sometimes smile when I am alone at something I see or think of, but still. Those smiles are very sweet and clearly genuine.